Yes I did just quote Madonna and rightfully so. She died before I was born and In my opinion Bette Davis was the greatest actress of all time and I am sure a lot of people would agree with me. The American Film Institute have placed Davis second on the list of the greatest female stars of all time (Katharine Hepburn came first) and made her the first woman to receive a lifetime achievement award. If any actress deserves the title of trailblazer it would Davis, she was the first person to be nominated for ten academy awards, winning two, one for Dangerous in 1935 and one for Jezebel in 1938. October 6th 1989 was the year Bette Davis died at the age of 81 but her films live on. 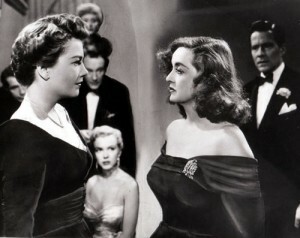 This month is also anniversary of the release date of one of her films ‘All About Eve’ released October 13th 1950. 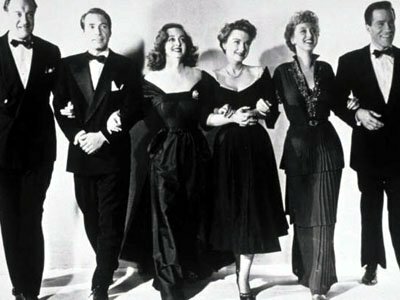 ‘All about Eve’ is on my list of great films, maybe not pushing the boundaries but this film emulates the greatness of what films used to be, therefore there is no other appropriate time to review it. Based on Mary Orr’s story The Wisdom of Eve, ‘All about Eve’ was written and directed by Joseph L. Mankiewicz. Starring Davis as Margo Channing an ageing broadway actress who after a performance of Lloyd Richards (Hugh Marlowe) play is introduced by her best friend, wife of Lloyd – Karen (Celeste Holm) to Eve Harrington an obsessed fan played by Anne Baxter. In Margo’s dressing room Eve tells her, Karen, Lloyd, Birdie (Margo’s maid) played by Thelma Ritter and Margo’s younger director boyfriend Bill Sampson played by Gary Merill about her personal difficulties of losing her husband in the war and how she has followed Margo’s career. Margo decides to take her under her wing giving her a job as an assistant, much to the dismay of the quick witted Birdie. 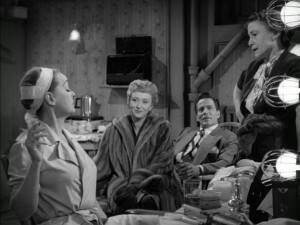 Innocent looking Eve deceivingly creates trouble for Margo’s relationships with Bill, lloyd and Karen, turning them slowly against her. Eve uses Addison De Witt (played by George Sanders) a critic, Lloyd, Bill and Karen to climb to the top of the theatre world. One of the few black and white pictures I remember in colour, All about Eve stands out as one of the best classic movies. The skilled sneaky manipulation that Anne Baxter brings to Eve is incredible, which works well against Davis’s more openly ego centred character Margo. If any actress is able to amount to half of Bette Davis’s talent they would be considered a truly inspiring actress. The cast is impressive and every character in this film is so interesting, you are never bored even though the film is over two hours long. My favourite character has to be supporting actress Thelma Ritter who’s timing and delivery of sharp wit is always just enough. There is even an amusing small part for Marilyn Monroe, it being one of her first picture appearances. Famous for lines like ‘Fasten your seatbelts. It’s going to be a bumpy night’, the AFI lists it number 16 of best American films and it won 6 of the 14 Academy Awards it was nominated for. Mankiewicz provided an unforgettable film that lives on forever. Want to travel the world and volunteer?